I recently discovered a BBC mystery show called “Shetland.” Well-written and realistic without being gruesome, the series is set on the Shetland Isles, an archipelago made up of over 100 islands (15 of which are inhabited). 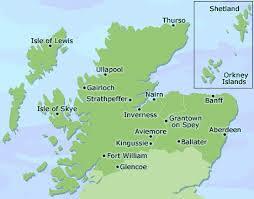 Located northeast of Britain in the subarctic region, the islands are part of Scotland. They are closer to Norway than mainland Scotland, and the history of the two countries is strongly intertwined. The first episode solved a cold case that occurred during WWII (my favorite period in history!) and involved sailors who were part of the Shetland Bus. I was unfamiliar with the Shetland Bus, so as soon as I finished watching, I dug out my computer and started researching. 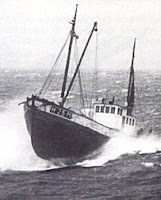 The Shetland Bus was the nickname given to a loosely formed group of commercial fisherman who agreed to work for the British Secret Intelligence Service and Special Operations Executive. Their main purpose was to ferry agents, supplies, communications equipment, and weapons in and out of Norway. They also helped Norwegians, who feared arrest by the occupying Germans, to escape. Initially there were fourteen fishing crafts used, but after several losses of boats and men, it was decided that faster ships were required. The new boats were powered by 1,200 hp diesel engines and could reach a top speed of 25 mph. In 1943, the U.S. Navy assigned three submarines to the operation, and it became an official part of the Royal Norwegian Navy. Most of the crossings were made in the winter under cover of darkness. (Like Alaska, Shetland experiences nearly 20 hours of darkness during the winter months, and the same number of hours of daylight during the summertime.) I cannot imagine how cold it was in an open boat going over the North Atlantic in winter – brrr! Leif Larson was one of the most famous of the “Bus” men, conducting fifty-two crossings and becoming a highly decorated Naval Officer. 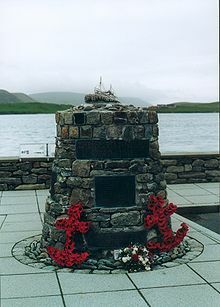 A memorial erected in Scalloway commemorates the operation and the brave men associated with it. More information can be found in David Howarth’s Shetland Bus: A WWII Epic of Escape, Survival, and Adventure. I haven’t read the book, but over 80% of its ratings are four- and five-star.